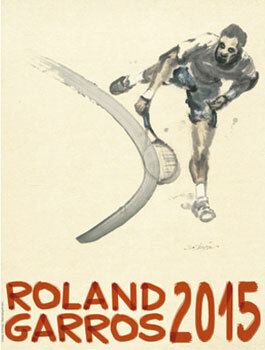 Finally a day without rain at Roland Garros! I started my day watching from my favorite spot in the stands Alex Zverev-Igor Sijsling and Elias Ymer-Blaz Rola. I could not believe my eyes watching Sijsling-Zverev tied on 6-6: The Dutchman had dictated every rally and was by far the best player on court. He missed a lot of easy shots during first set but managed to stay focused during tiebreak while Zverev was wasting mental energies discussing with umpire about marks. I later moved to Veronica Cepede Royg that had on paper a very tough match against Laura Siegemund but as I wrote yesterday she looked great against CiCi Bellis so I was looking for a confirmation of that, and found it. Cepede Royg was again extremely solid and defeated her opponent in straights. Andrea Arnaboldi- Pierre-Hugues Herbert resumed from 15-15 and they arrived to 25-26 with a pretty clear edge for Arnaboldi, as Herbert was not as clutch that said, credit to Herbert that played great risky tennis when needed. Arnaboldi won the longest match in RG qualies with this winning return. Quick impression from the huge serve of Beatriz Haddad Maia (who beat Nastassya Burnett 6-3 6-3) and for the amazing classy tennis of Alexa Glatch: her backhand slice his amazingly effective and I was glad to watch also two dropshot returns. The clean play produced a 7-6 6-2 victory for her over Ekaterina Bychkova.